The (PRODUCT)RED iPhone 8 and 8 Plus adopt a striking new crimson appearance to help support one of Apple's longest running partnerships. We go hands on and take a closer look at the special edition handset. Apple started pre-orders for the (PRODUCT)RED iPhone on April 10, with units showing up in Apple stores and customer doorsteps today. There are slight differences between this year's (PRODUCT)RED iPhone 8 and 8 Plus and last year's (PRODUCT)RED iPhone 7 and 7 Plus. Obviously, the back material has changed from aluminum to glass on all the latest iPhones, but the bigger news is the black front fascia. The (PRODUCT)RED iPhone 7 utilized a white front face, which was so widely criticized it even prompted some to create their own black-on-red version. This year's red iPhone 8 and 8 Plus have adopted the black front that so many people had yearned for. Checking out the special edition iPhone, it looks pretty darn sharp. We are huge fans of the vibrant color scheme. It certainly makes a bold statement, and would personally make the decision easy to go caseless. Those rocking a red iPhone are certainly rarer a sight to see than those with the usual color options. (PRODUCT)RED models are often released well into a device's life cycle to stoke sales, meaning many have already purchased their iPhone 8 back when it launched last year. 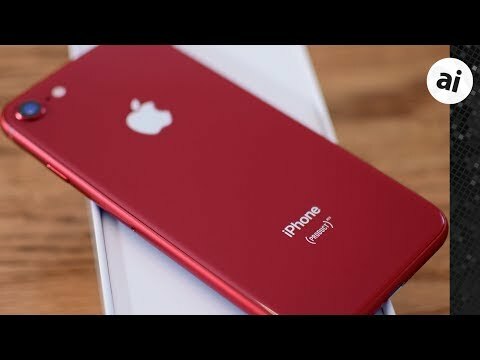 If you want the red look but don't want to lay out cash for a new phone, Apple also sells (PRODUCT)RED leather and silicone cases as well, which gives a similar look for a lot less green. (PRODUCT)RED Apple accessories are available at the company's online and brick-and-mortar stores, as well as third-party resellers like Amazon and B&H Photo. Alongside the iPhone 8 and 8 Plus, Apple also debuted a new (PRODUCT)RED iPhone X leather folio. We got a look at that earlier in the week. While the case is pretty great looking, we would perhaps prefer had Apple released a red iPhone X as well. It would require a bit more effort on Apple's part to create a (PRODUCT)RED iPhone X variant, as the chassis is stainless steel instead of aluminum. Apple utilizes a different process to color the steel rather than the aluminum, which is anodized. In 2017 alone, Apple raised over $30 million for the Global Fund, which aims to fight AIDS, tuberculosis, and malaria. In total, Apple has contributed over $160 million through efforts like their (PRODUCT)RED devices and App Store promotions. It’s the same but red... what’s the big deal? Apple should really have the (PRODUCT)RED phones ready at the introduction of the new iPhone cycle. No telling how many more would be sold at the launch. They obviously are generating a lot of cash for the (PRODUCT)RED program but untold sales are being lost. Why does Apple wait so long to release red devices? Likely a mid year slight sales boost. Plus if people are on a Product Red cycle it’s still a yearly interval. I think the point he’s trying to make is, it’s a different color. It functions identical to every other iPhone 8 and 8+ with the additional benefit of being able to show other people how socially responsible and progressive you are. So, given that it has identical specs to every other iPhone 8 and 8+ and functions identically to every other iPhone 8 and 8+, why does this product warrant a special hands on article? I mean, it’s not like AI has a hands on article for every color. So why this phone, other than the obvious value signaling going on? It really is a fantastic looking phone. If only there was an X version. No way to confirm it, but that’s my guess, too. There is no X product RED cycle! its (RED) and portion of its $$$ goes to (RED), imagine at lunching and most $$$ goes to (RED). I like it a lot but I buy at the release cycle every two years. So I never get a product red. Priorities. Despite how we think of finished products, they don’t pop off trees fully formed...it takes teams of people running projects to get any new product into existence, even something as simple sounding as a different color. Remember the huge delay launching the white iphone 4? Should have been simple, just a color, right? While I can’t speak to what the tasks are in a coloring project, I have launched products before and know nothing is ever as simple as it sounds. So when launching a brand new product line, priorities say do the basics first. The white iPhone 4 was clearly a technical issue. There was no public delay so we can't know whether they learned their lesson about promising a color that they aren't sure they can deliver by a self-imposed deadline, it's just a way to buoy mid-cycle iPhone sales, or something else. My bet would be be this was planned to stimulate sales mid-cycle, but that's purely an assumption on my part. It sure is nice color red, though. I don't think their other (PRODUCT)RED options ever looked this good. I even considered it for a hot minute. I am curious about not coming to the iPhone X, which I believe is a steel casing compared to the aluminum casing of iPhone 8 series. Nah. They launch it mid-cycle to freshen up the line and maybe juice sales a bit. Makes sense really. It’s a beautiful new color mid cycle, for a good cause. Why over think it ? Having the black front this year is big for some folks. Are you seriously taking issue with this specific color getting more attention than the launch colors of an iPhone? It’s to show people how socially respnsible you are ? Hahah ok These are the problems we have ? Seriously ?